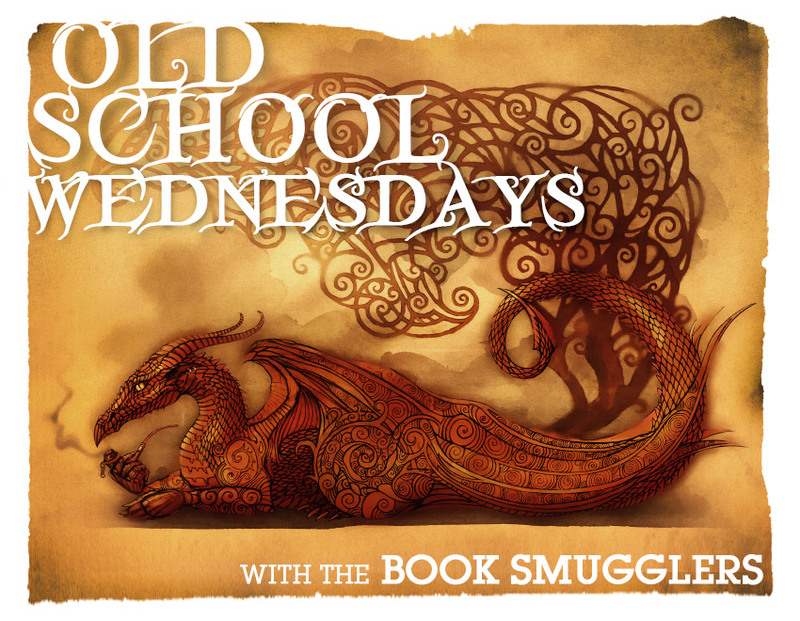 Old School Wednesdays is a weekly Book Smuggler feature. We came up with the idea towards the end of 2012, when both Ana and Thea were feeling exhausted from the never-ending inundation of New and Shiny (and often over-hyped) books. What better way to snap out of a reading fugue than to take a mini-vacation into the past? In March 2013, we asked YOU for your favorite old school suggestions – and the response was so overwhelmingly awesome, we decided to compile a goodreads shelf, an ongoing database, AND a monthly readalong/book club. Shortly after Shuichi Saito’s father becomes obsessed with spirals — snail shells, whirlpools, and man-made patterns — he dies mysteriously, his body positioned in the shape of a twisted coil. Soon, the entire town is afflicted with a snail-like disease. Why did we read this book: We wanted to do a joint review for Halloween Week and wanted something horrific. When I was a teenager, I went through a spirals phase: I became obsessed with the idea that spirals are a prevalent symbol that appears in older cultures, in nature, in art. That it could be used in hypnosis and it can represent the idea of infinity – or ever-evolving. I even dressed in spirals: clothes, rings, necklaces. 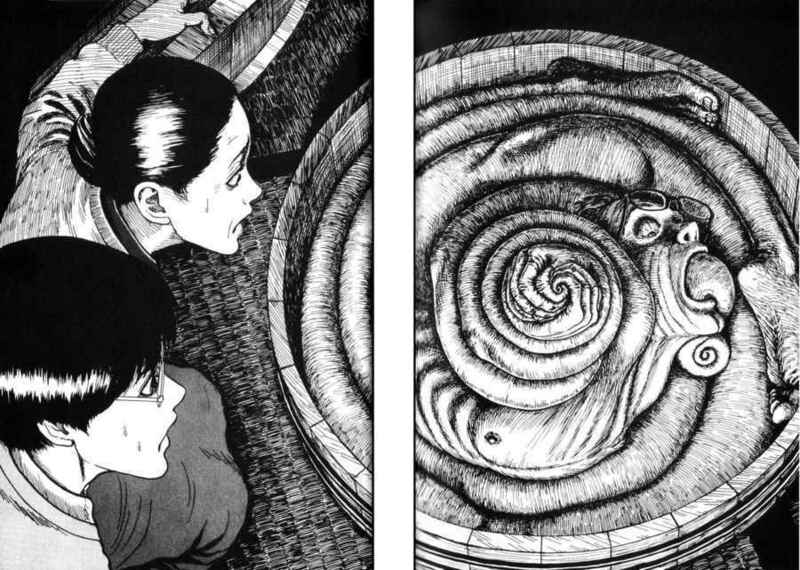 Reading Uzumaki, a manga series written and illustrated by Junji Ito, born of the author’s own preoccupation with those pesky mysterious spirals, brought it all back with a bang. Bonus points to this series for making me revisit this long-forgotten part of my teenagehood. Uzumaki follows the citizens of a small town called Kurôzu-cho, where enigmatic, unsettling events surrounding spirals take place. Narrated by a young high schooler named Kirie, the series has three volumes divided in issues that tell a short story each, usually surrounding a different character. Each story interconnects with the overarching idea that spirals are taking over: as each inhabitant of the town, as each event, become part of this ever-evolving, disquieting mythical whole. It starts with Kirie’s boyfriend’s Shuichi’s family succumbing to the “curse”: first the father, then the mother. Monstrous spirals SLOWLY take over their minds and eventually their bodies. This is only the start and as the story progresses, from short story to short story, events spiral (eh) out of control until the – fantastic, in my opinion – ending. Shuishi seems to know more than anybody else that there is a curse that plagues the town and the portents of worse things to come are telegraphed: because spirals are everywhere and how do you get away from them? You can’t – that’s the whole idea behind Uzumaki. An idea that drinks from a pool of archetypical fear and symbolism which plays into our deepest fears. And the darker the events become, the worse people behave, leading to another horror staple: that of humanity turning against each other in their darkest hour. With that said, the episodic nature of the storytelling, as effective as it is in conveying the sense of horror of the town and the spirals, is not as effective in developing the main characters. We barely know Kirie and her boyfriend and we don’t really care about them (in fact, they barely even seem to care about each other). Still, there is distress, discomfort and freaky, creepy horror here in spades for a great Halloween read which is what I was looking for. 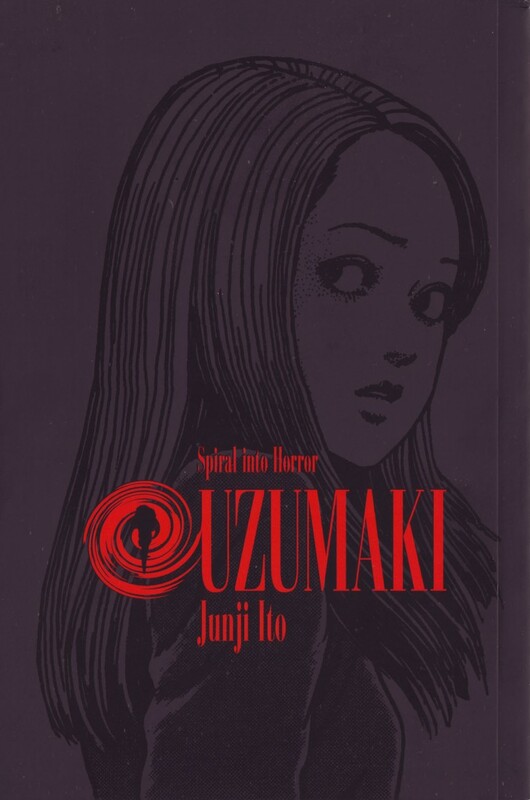 First, let me start of this review by saying that I’m a little creeped out by Ana’s Spiral Obsession Admission–but that’s only because Uzumaki is so damn effective at creeping you out when it comes to anything in the form of a spiral. To Ana’s point, there are lots of really groovy things about spirals–particularly when it comes to math, the golden ratio, and golden spirals. I remember when I first learned about the Fibonacci Spiral my mind was BLOWN. It’s still blown. Seriously, look at all of that crap in nature! IT’S AMAZING. It’s also terrifying, if you go by Junji Ito’s vision of spirals. Originally published as a serial in a weekly magazine, Big Comic Spirits, Uzumaki is a loosely–very loosely–connected narrative that focuses on a small seaside town of Kurôzu-cho. The story (loosely, again) follows a reserved girl named Kirie at various points in her life as she encounters spirals and their horrific effect on the people in her town–including her classmates, her neighbors, her father, her boyfriend, and even Kirie herself. There’s a dreamlike–no, nightmarish–quality to Uzumaki and its disjointed, vignette style of storytelling. We flip through different spiral stories, the narrative itself spiraling into greater depths of despair–from the obsessed parents of Shuishi and their ends, to Kirie’s new friend in class who is so beautiful and magnetic and herself a spiral, to the lighthouse with its hot heat light, to the pregnant women and their mosquito-like tendencies and thirst for blood… these stories have nothing and everything in common. They share the same underlying premise: Kurôzu-cho is a cursed place plagued by spirals from which there is no escape. And each episode reinforces this claustrophobia, this increasing sense of pressure and madness until the last, twisted frames. In other words: Uzumaki is terrifying and dreamlike and strange; it’s disjointed and episodic and it’s perfect in its bizarre form of terror. Read it at your own peril. File explorer is the program in your pc by which you will access the saved data and access the storage drives if you get any trouble with then from here http://fileexplorerwindows.com you will get help with file explorer in windows 10 from our tutorial and do it online without facing any trouble.